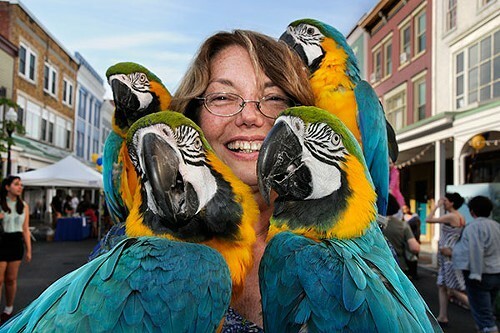 Gloria Waslyn with her parrots at the Chronogram Block Party on August 17. Besides the fact that the Kingston YMCA Farm Project raised about $1,000 to help kick start its youth-oriented educational farm, the dunking booth was just a really fun time. So many local notables took the plunge in honor of Chronogram, including Paul Maloney of Stockade Tavern and Joe Concra of the O+ Festival. We might be a bit biased, but our favorite moment had to be watching our goggle-clad editor, Brian K. Mahoney, get dunked nearly 35 times. Thanks for taking 35 for the team, Brian. Our Chronogram beach balls were a hit. During the set by Superhuman Happiness, Chronogram staffers climbed up to the third story of Jeffrey Milstein's gallery building and dropped about 100 beach balls out into the crowd. A good many of them got caught on the second-story roof, but we persevered, went down to the second floor, and gave the crowd what they wanted. For the rest of Superhuman's set, the night sky was highlighted with streaks of white from the soaring, striped beach balls. The guys at BSP Lounge did a great job with the sound for our lineup of stellar bands at the block party. But, alas, some hiccups are inevitable. When the power went out (momentarily) during Superhuman Happiness's set, they turned a problem into an opportunity. Descending from the stage, the multi-instrumental funk band continued their set amongst the crowd. They were back on stage with full sound in no time, but the brief acoustic interlude was a highlight of the evening. Our Chronogram cover cutouts, which included Terry Rowlett's August 2006 cover Man With Axe, Steven Kenny's January 2011 cover Winterlude, and Dave Horowitz's June 2012 cover Humongous, were one of our favorite parts of the block party. So many people took photos with their faces in these iconic Chronogram covers, including Nee Nee Rushie, singer of The Big Takeover, in the Winterlude cover (The Big Takeover was profiled in that issue of Chronogram!). Many block party attendees also made their own Chronogram cover at our DIY art tent. We got many creative and thoughtful submissions—thanks to everyone who contributed! Gloria Waslyn of the Kingston Festival of the Arts came to the block party armed with parrots. Literally—she had two brightly colored parrots on each arm. These stunning birds—with teal wings, golden bellies, mossy green heads, and white and black striped faces—sat politely on the arms of any people who were interested (and many were). Maybe Waslyn will bring the parrots out again for this weekend's Kingston Festival of the Arts—you'll have to go to find out!